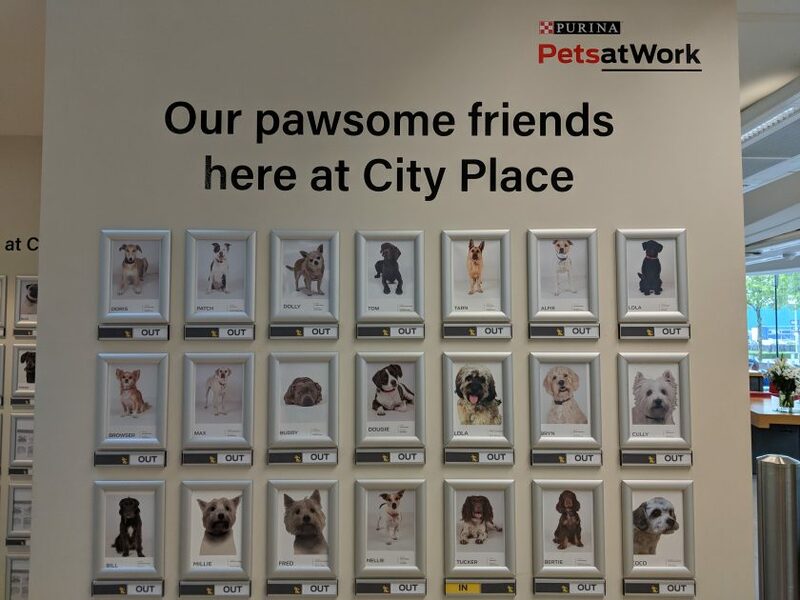 #SP I’ve often talked about the many advantages of creating a dog-friendly work place. 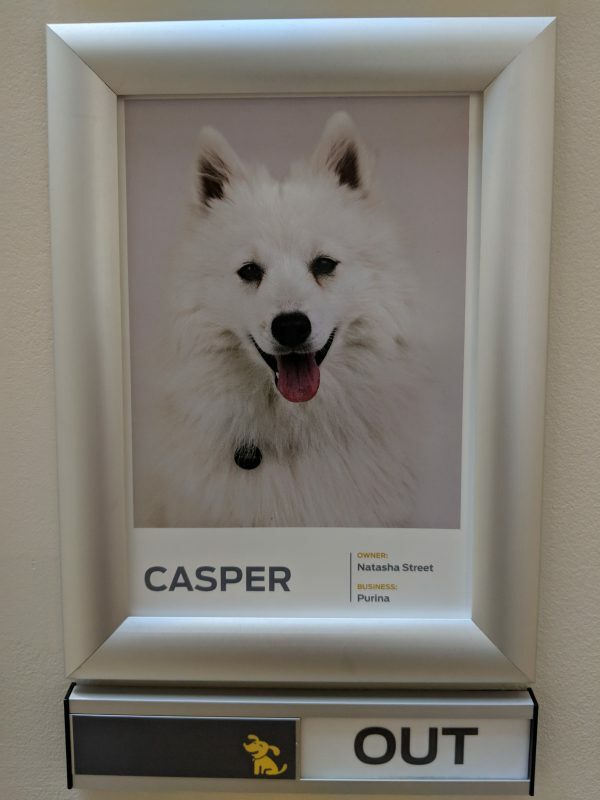 I recently had the opportunity to visit the headquarters of @PurinaUK where I encountered the most dog-oriented office I have ever seen. 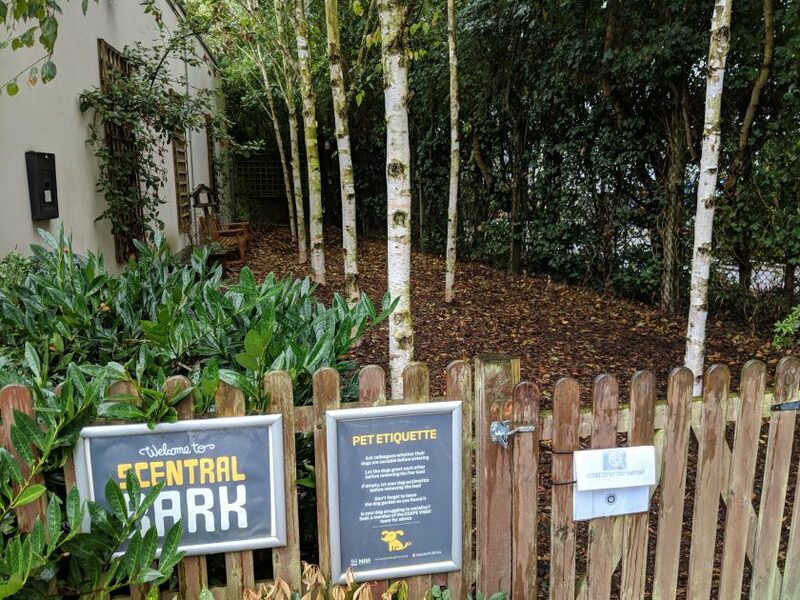 I’ve put together a few photos from my visit, showing some of the key aspects that make this type of policy successful. 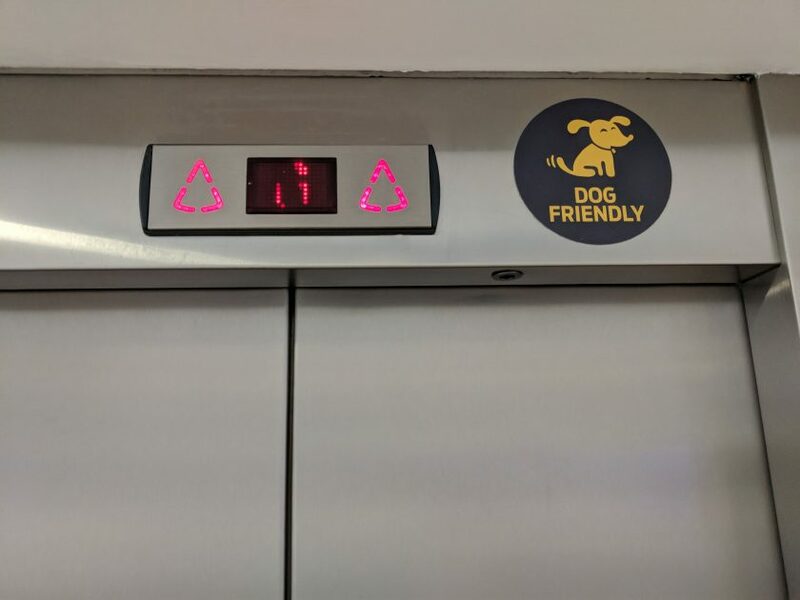 It’s important that dogs feel welcome to an environment that is traditionally not “dog friendly” – or more accurately, it’s important that owners feel that their dogs are welcome. 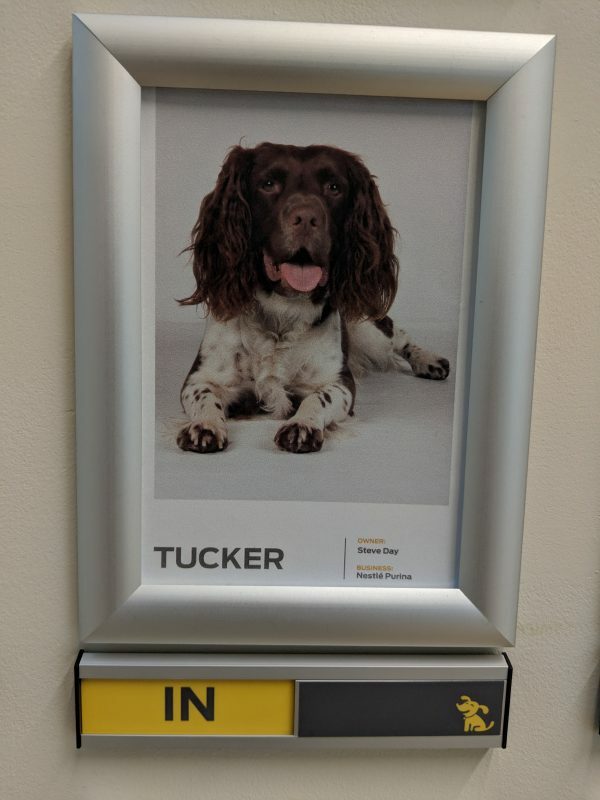 The Purina offices have a large noticeboard on arrival, with photographs of all of the regular “working dogs”, along with “in” and “out” slots for them to check as they arrive and leave. 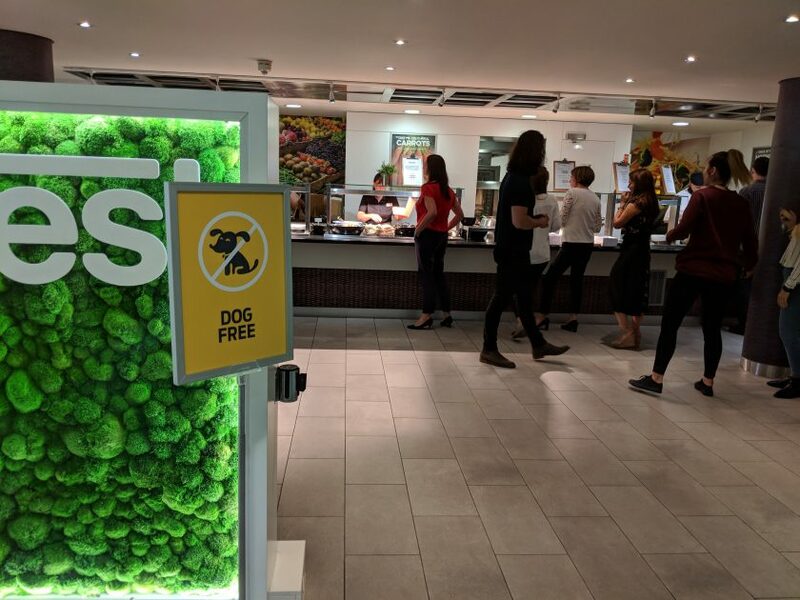 This makes an attractive visual display which is a bit of fun, but it also has the important function of reminding people that the working environment genuinely takes the presence of dogs seriously. 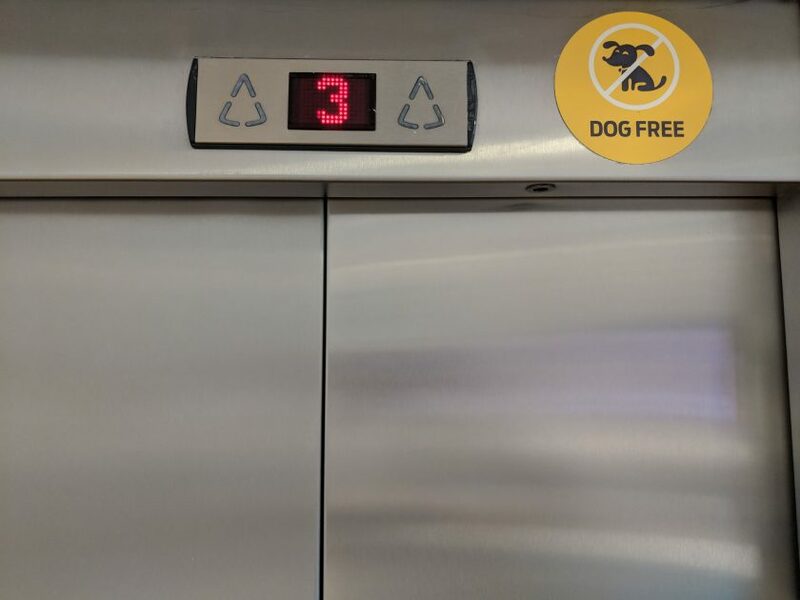 For a successful dog-friendly policy, rules are essential. 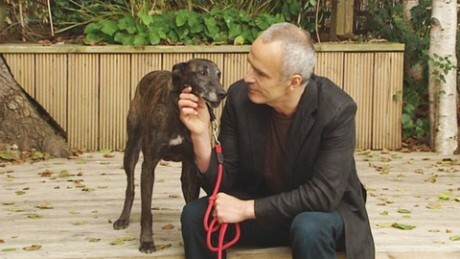 Dogs don’t know how to behave in such an environment, and most owners are not sure what to do either. So a list of written rules, posted on notices, is the obvious answer. Many of these rules may sound like common sense, but it always helps to have them written down like this. Like any office, the first stage of the day is to move through the front door of the building, through a hallway, into a lift, then along a corridor till eventually you arrive at your work station. When dogs are involved, everything needs to be considered from a dog perspective. 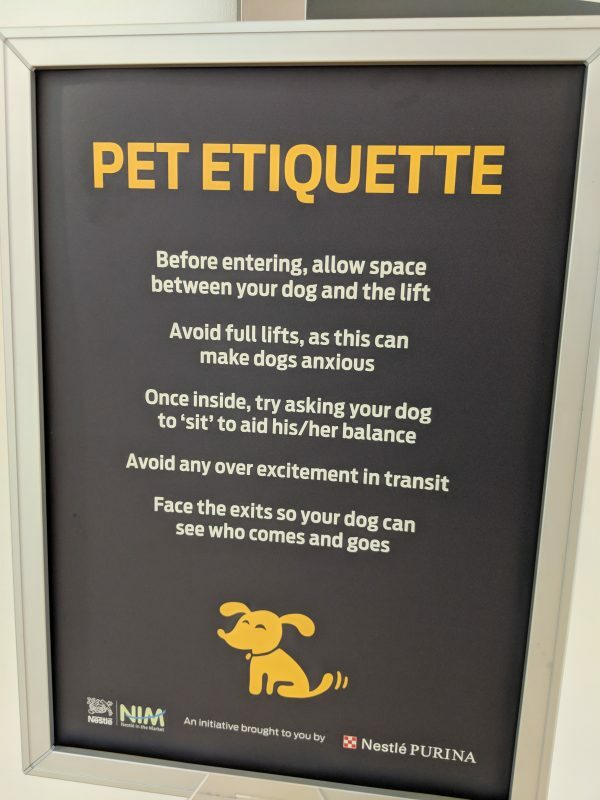 So dogs need to be kept on leashes, there needs to be a dog-friendly lift (as well as a dog-free lift for those who don’t enjoy sharing space with a dog), and signage needs to make everything clear to everyone. 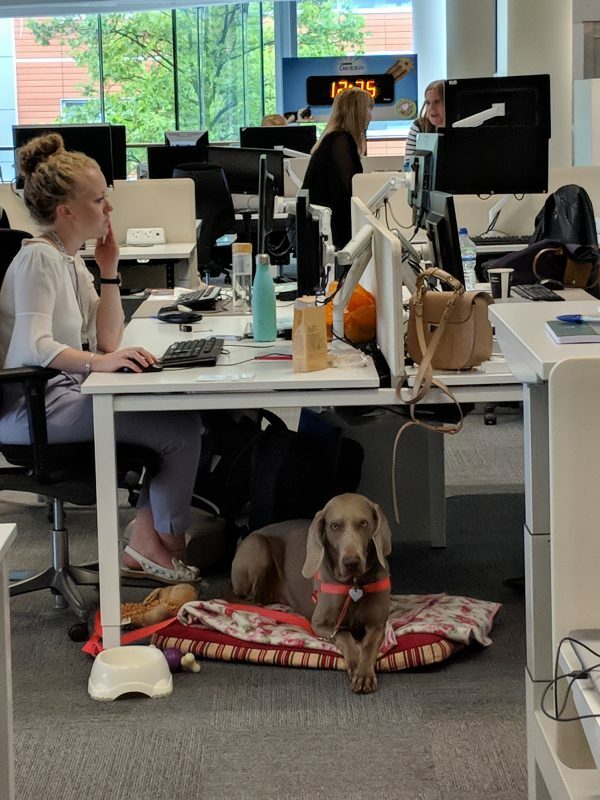 Dogs have their own beds and toys under the desk, and once they have had their morning walk, most are happy to settle down and snooze while their owners get on with their usual workload. 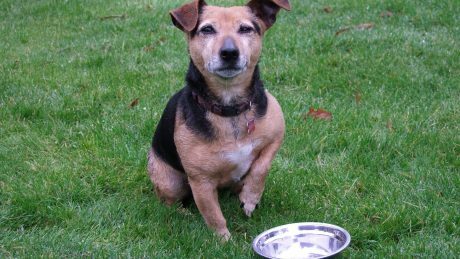 Just like humans need to take a break to refresh their sense of concentration, so do dogs. 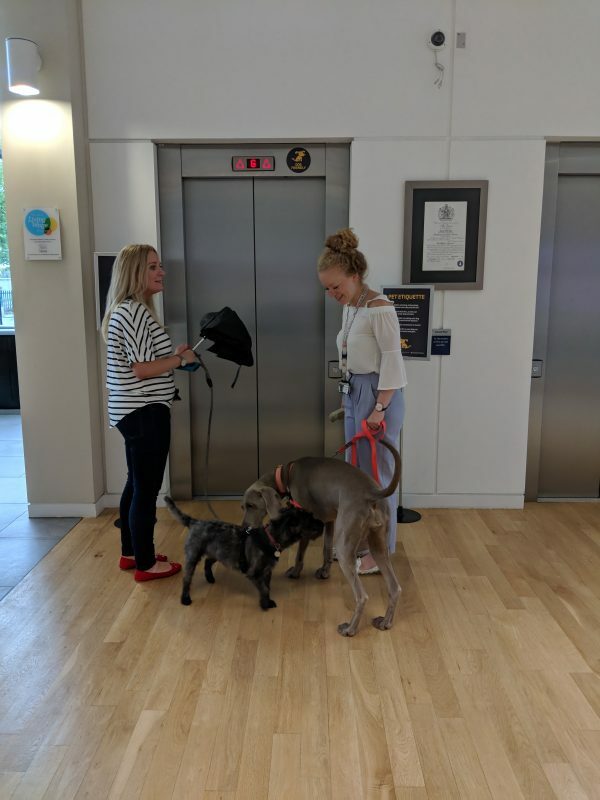 In the Purina offices, it isn’t just owners who take their dogs out for a stroll; non-owners are encouraged to “borrow” a dog from time to time, to take them outside to “Scentral Park” (yes, the Purina team love their puns!). This gives the dogs an enjoyable break from the indoor atmosphere, and it’s good for people too. 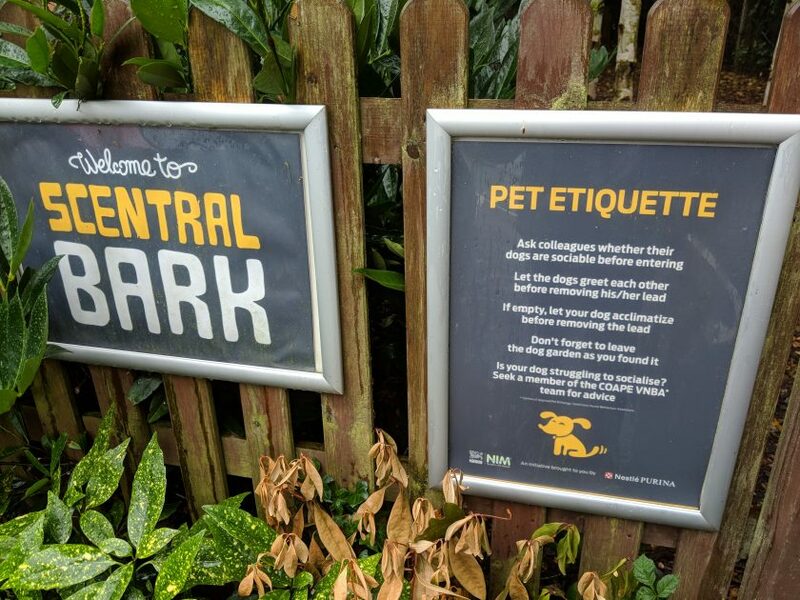 As before, rules are important to avoid problems, and signage is the simple way to get clear messages across. 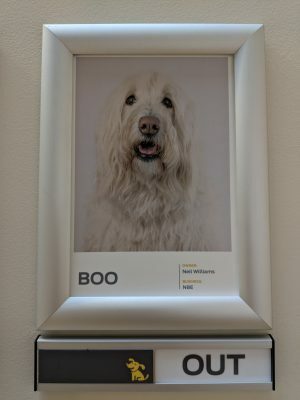 My visit to the Purina UK headquarters was a real eye-opener. I learned that there is nothing to fear, and much to gain, from including dogs in our daily lives, whether we are at home or at work. 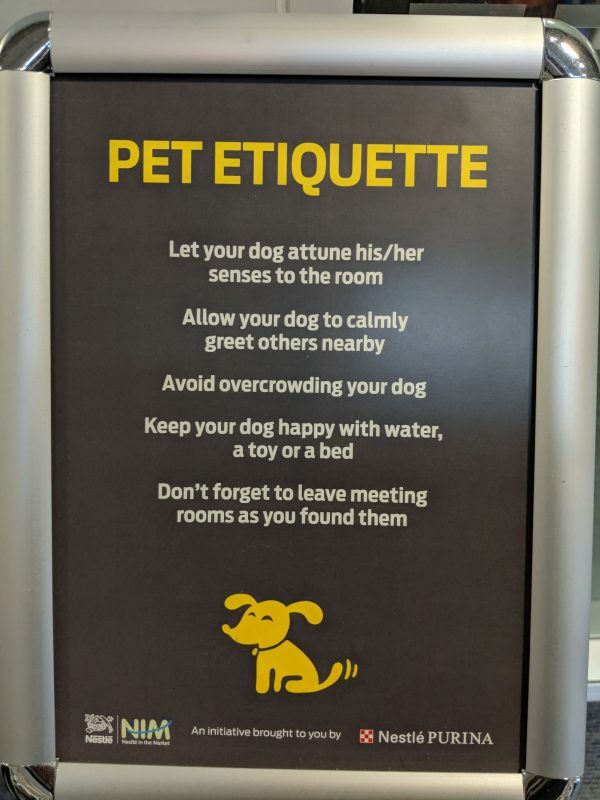 Dogs are social creatures who enjoy human company, and most dogs are calm, well-behaved creatures who don’t cause problems as long as they are given guidelines and boundaries. 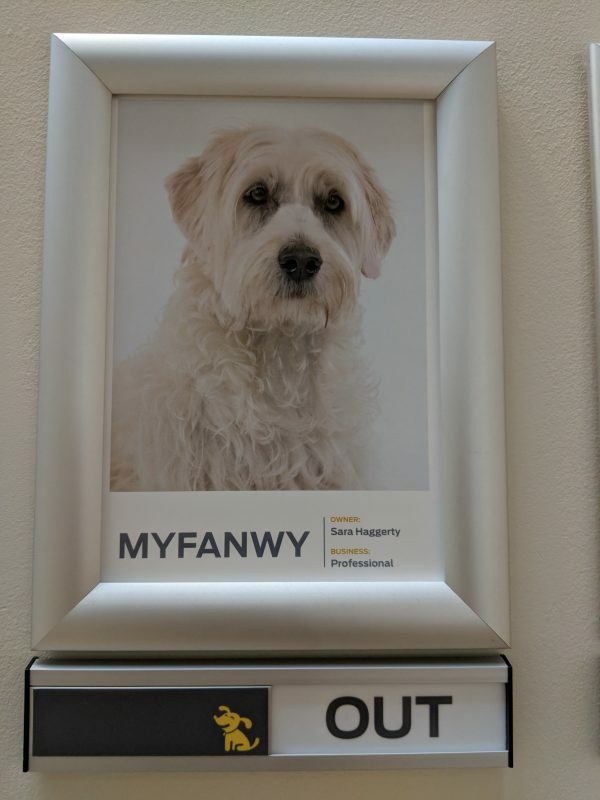 Is your office dog-friendly yet? If not, why not? 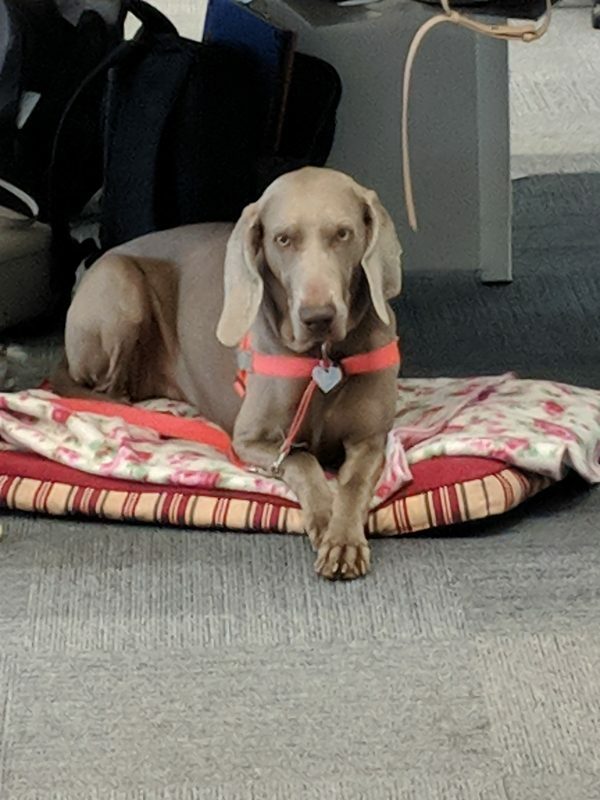 There are so many advantages for workers, employers and not least, the dogs themselves. 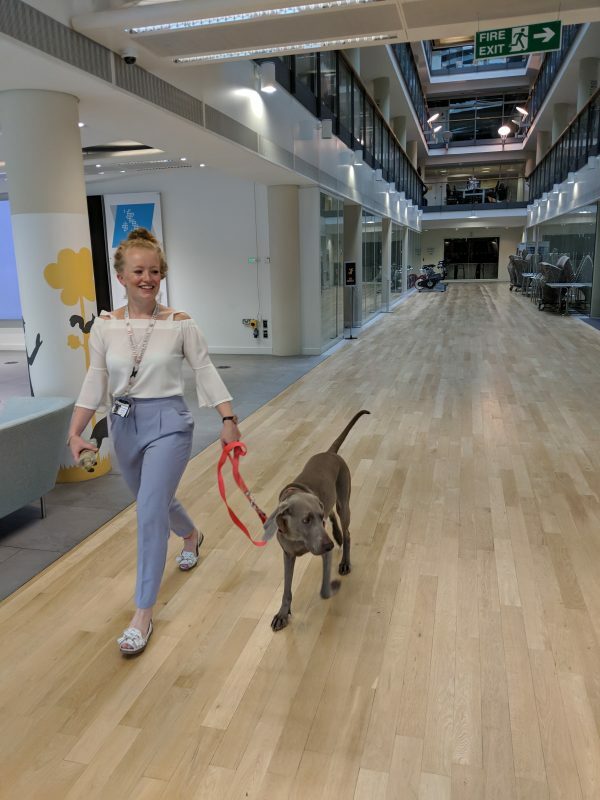 If you are thinking of implementing a pet friendly policy Purina has some helpful hints and tips and more information about the benefits of having pets in the workplace. See here for details.